Laying in my bed at night I am listing to my sink facet in my bathroom as it continues to leak. I wonder how much water is being wasted, and if it would make a difference in the drought. And then I remember that every drop counts. Every drop could make a difference in what is considered the largest drought in California’s history. This week California got a smidgen of water, okay slightly more then a couple drops. However it was close to what we needed to start recovering from drought. 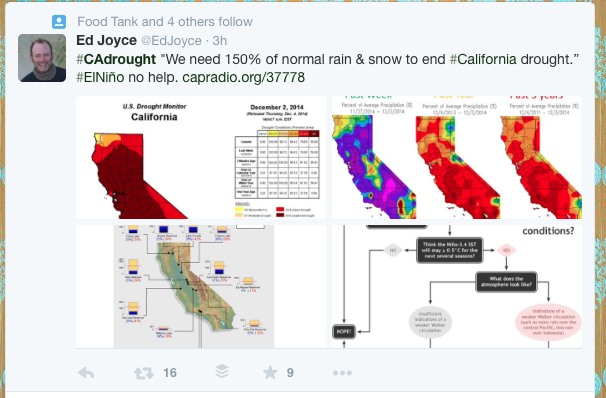 The origin of water spark some conversation on twitter about the rain (and the drought) seemed to be the rain itself, later on news organizations posted articles articulating how far California is from being declared drought free. This seemed to be a common post which showed various maps of the drought, the map on the far left is a popular map that is apart of a interactive website. I just thought this post was really cool, because I used to live about two hundred feet from this weather station. 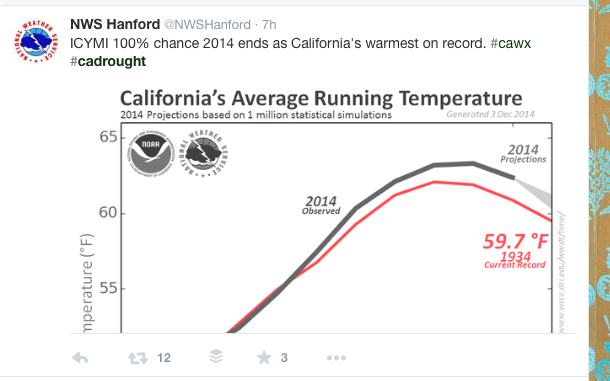 However, they do provide real time data about the drought and the high temperatures. This above picture seemed to be the general reaction of twitter universe. Most users where glad that rain had occurred, but they realized that this is only a drop in comparison to the water that California needs.